It's Bout of Books time! Normally, I set myself some goals to work towards. But this time I decided to go very low-key. I don't need any more pressure in my life right now. I'll read however much I'll read, and I'll be happy with it! That whole teacher-getting-ready-for-school thing hit me hard this week. I was way busier than I thought I would be. Very little commenting and no chance to do a challenge. But I did finish two and a half books, so the week was not a total loss. 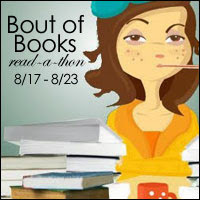 I still had fun, and I'll definitely still participate in the next Bout of Books! How is Station Eleven? I've been meaning to pick it up so would like to know how you're finding it. And Happy Reading!! Station Eleven was beautiful and freaky, all at the same time. It was an interesting combination!